But, after nine years of experience working with teens with autism and other special needs….nine years of trying out a multitude of interventions…I have a TON of successful ideas that I just know you’re going to love! 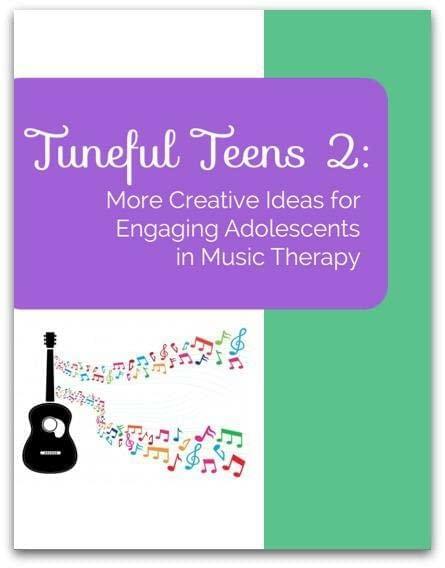 Tuneful Teens is your guide to navigating the world of music therapy with adolescents with special needs, and it’s only $16! Don’t need any more convincing? AND THAT’S JUST THE BEGINNING – I share many more tips, resources, and ideas in the 40 pages of Tuneful Teens 2. BONUS…I’ve even included a Pop Song Hot List with all the freshest, hottest songs (updated every six months!) You do NOT want to miss out on this! The best part? You can have all of this – over 40 pages of creative ideas, sheet music, and activity templates – all for only $16! “When I first started out as a new music therapist, the population that intimidated me the most was the tween and teen crowd. That’s why I was so excited when my friend and fellow music therapist Amy Kalas launched her e-book, Tuneful Teens. Amy provides everything you need — step by step procedures, templates, sheet music, etc. — to implement the interventions in your music therapy sessions. I highly recommend Amy’s book, and also want to give her a shout-out for celebrating the first year of her wonderful blog, Wholesome Harmonies. It has grown leaps and bounds since last year, and I’m excited to watch it continue to do so!